Niki de Saint Phalle, like other artists such as Van Gogh, Picasso or Jean Cocteau, liked to illustrate her letters. 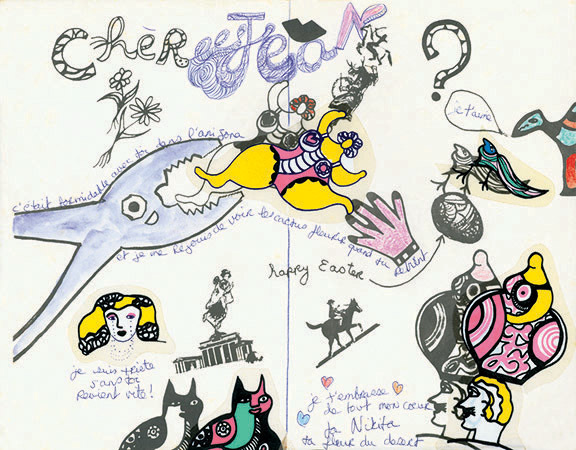 The Niki Charitable Art Foundation Archives contain some postcards, letters and faxes Niki de Saint Phalle wrote in French, English and Italian. They are available for curators and researchers to consult. These documents are precious for both their content and layout. They reveal the artist’s personality, are sometimes so elaborate they are considered art works in themselves, and most importantly are testimony to her artistic voice. In her correspondence Niki de Saint Phalle’s personality illustrates her great imagination. She liked to include drawings or collages in her correspondence. She created stationery by making xerox copies of her drawings and sticker collages: dancing Nanas, flowers, animals, hands, or other random imagery like pliers, cowboys or Greek temples. Then she would further personalize many letters by adding her own stickers, decals and feathers. Extract of a letter from February 1984 to Jean Tinguely – “The Tuscan Gazette” as Niki titled it. She used an endless list of affectionate nicknames for her close relations and herself, Jean Tinguely for instance is the little fleur de sel, Santa, the light keeper and she is: Nikita, your desert flower, the kind crocodile, the bad weed, etc… Her words give an intimate and moving portrait of the artist. Adorned letter from 1974 to Jean Tinguely © 2017 Niki Charitable Art Foundation, All rights reserved. 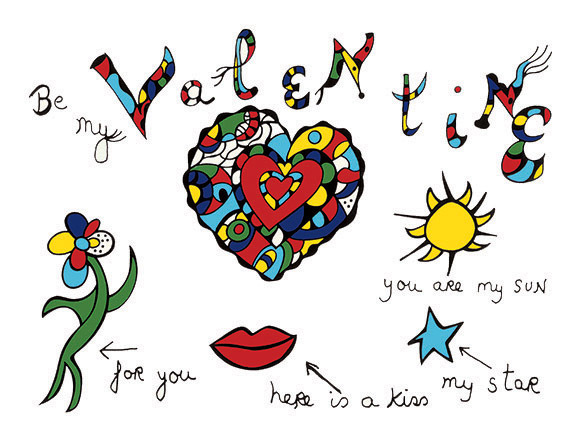 Among Niki de Saint Phalle’s correspondence one can find etchings, lithographs or serigraphs designed by the artist which were created for sending on special occasions: New Year, Valentine’s Day, Mother’s day, weddings and exhibition openings. These small pieces of art, sometimes slightly different from one another and therefore often unique, were usually dedicated to her staff, friends or family. They exemplify the artist’s generosity and serve to include her in the Mail art movement. Mail art began in the 1960s when artists sent postcards inscribed with poems or drawings through the post rather than exhibiting or selling them through commercial channels. Its origins can be found in Marcel Duchamp, Kurt Schwitters among others. It was the New York artist Ray Johnson (1927-1995), a contemporary of Niki de Saint Phalle, who in the mid 1950s posted small collages, prints of abstract drawings and poems to art world notables. This gave rise to what became known as the New York Correspondence School. Mail art can take a variety of forms including postcards, packages, faxes, emails and blogs. It is considered to be the predecessor of net art. Be My Valentine, offset from circa 1988 © 201 7 Niki Charitable Art Foundation, All rights reserved. Niki de Saint Phalle’s letters serve as vivid testimony of her artistic expression. Through letters, sometimes including preliminary drawings, she expressed her opinion on projects and exhibitions in which she participated or visited. Her writings show how much she valued her collaborator’s opinions. In correspondence to Jean Tinguely she describes the entire building process of the Tarot Garden over more than 15 years. In some letters she indicates her vision of how things will be done. In others letters, how she overcame some technical difficulty or artistic dilemma, and in many, how Jean’s art would add to her project. some slightly pink ! I will have some samples next week. Thanks to the many items of correspondence covering more than 40 years, we learn about alternative visions and the creative process that made her work so distinctive.